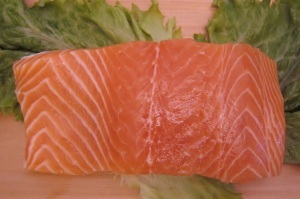 Salmon Is Often Used In Controlling The Inflammatory Immune Response Caused By Allergies Or Skin Disorders In Your Dog. Salmon is very high in Omega-3 fatty acids and supports the development of the nervous system and visual integrity by protecting cells in a healthy layer of fat to prevent them from damage or degradation. It a good source of Niacin, Vitamin B12, Selenium and Phosphorous. Crude Protein(min) 13.0% Crude fat(min) 6.0% Crude fiber(max) 2.0%.